Depending on where you buy you hamster from, you may need to tame him or her. 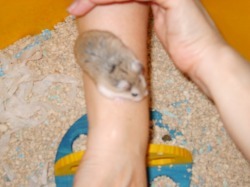 Hamsters from a breeder usually do not need to be tamed as they have been handled from an early age. 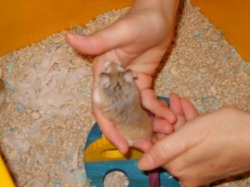 However, if you purchase a hamster from a pet shop or adopt a rescue hamster, you will probably need to do some taming. The key to successfully taming your hamster is patience, and I cannot stress this strongly enough! Many people expect their new hamster to be tame and cuddly in a few days, but this is unrealistic. 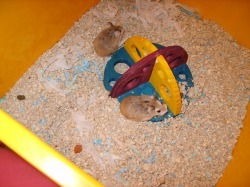 Every hamster is different; some may take months to become fully tame and others may be tame in as little as a week. However, based on my experience, I would say that on average it takes around a month to completely tame a hamster from scratch. 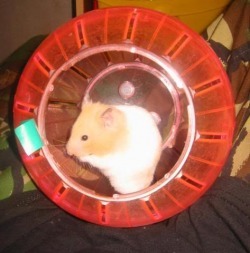 If you are still struggling to tame your hamster after 2 months, I would recommend visiting one of the advice forums listed under the Links page for futher suggestions. Depending on your location, there might even be a hamstery near you who offer a taming service for those having difficulty. Personally, I like to use different taming methods for Syrians and dwarf hamsters and you will find details of both methods below. 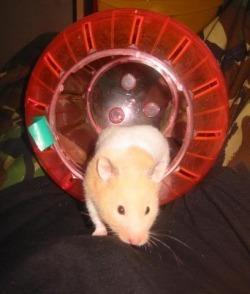 The following article was written by Manda of Mythic Hams and is a tried and tested method used by myself many times for taming rescue hamsters. Once your new Hamster is 'settled in' start by feeding treats in the evenings, once your Hamster is up and about, and talk to them. This gets them used to the sound of your voice and reinforces your hand being a 'bearer of good things' and so a positive thing rather than a new scary thing trying to stroke them or pick/scoop them up. Look at it from a hamster's perspective - it could well be that the last time they were 'scooped up' was from the pet shop and they ended up in a whole new weird place! After a few days feeding treats and talking at your new furry friend you can start trying to get Hamster to step into hamster ball, which can take a while for them to be brave enough to step in. So be prepared to just stand there holding it a while while Hamster plucks up the courage to come and check it out! Once they're in the ball, let them have a run round for 10 minutes or so and then let them hop back into their cage. This is important; once they are used to the ball and know they will be returning to their cage Hamster will feel OK about hopping in for their nightly run-around. Once they're used to a nightly 'run'... when they've had their whizz around room in the ball, sit down with them (hamster still in ball) then open it - so they can wander onto your knee and be petted/stroked and generally get used to you. Treats come in handy here if they need tempting out ! BUT because the ball is still there it gives them somewhere to dash back to if they feel scared. Doing it this way has worked wonders for me with nervous Hamsters. Once they get the idea of the ball and are OK with being stroked it's an easy step to get them to climb onto your hand to get into their ball. slow and steady does it really... eventually you WILL get used to each other! Hamster will sooner or later come to the conclusion hands/people are a good thing or at the very least not a scary thing - and you become more confident that you're not going to get bitten for your troubles! ! I don't use the ball method for taming dwarf hamsters as, generally, dwarf hamsters don't especially like balls! Therefore, i use the 'tub' method, as outlined below. Owners of Roborovski hamsters should be aware that this species is known for being especially difficult to tame and a fully tamed Roborovski might not seem very tame at all compared to a Syrian or Winter White! Firstly, you need to locate a plastic tub (or a box will do) with sides that are too high for the hamster to be able to climb out. Fill this tub with bedding (shavings, megazorb etc.). The bedding provides the hamster with a feeling of safety as they can burrow and hide themselves and also acts as a distraction from the hands that are about to appear from above! I also like to add a toy to give the hamster a feeling that they have something to hide behind. However, the toy cannot be something like a tube in which the hamster could completely hide and not come out! Something like the toy shown in the photo to the right is ideal. Put the hamster in the tub and leave them to investigate for a few minutes. Now slowly put you hands into the tub and make a crab shape, with fingers spread and space under your palms for the hamster to crawl. Basically, just leave you hands like that and let the hamster come to investigate you. This is where it helps if the tub is not too large. You can also do this with 2 people. 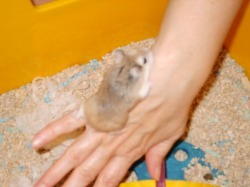 After a while the hamster should become comfortable with the presence of your hands. Now you can try scooping your hamster. The hamster will probably hop straight off your hands again and that's ok - let him go. Keep on doing this for a while until the hamster seems more relaxed with sitting on your hand. He may even try to climb up your arms! I wouldn't keep the hamster in the tub for more than about 10 minutes at a time without giving him a break back in his cage. I find it best to have a few 10 minute sessions of taming per evening. I find this method to be especially useful when taming Roborovski hamsters. For taming Chinese or Winter White I do things slightly differently. Whilst the Hamster is in the Taming Tub, I offer sunflower seeds (held between my fingers or left on the palm) to get them used to my hands and to show them that hands are kind not cruel! 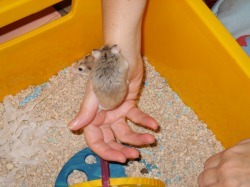 It is basically to build up trust between hamster and owner, which after all is what taming is all about! However, this doesn't work with Roborovskis as most robos will not take a sunflower seed from your hand, even when tame. Your hamster will be nervous about taking the seed at first, but in time he will learn that there is no catch involved (it is important not to try to grab your hamster whilst he is taking the seed).